We also offer shorter breaks during the summer season & by contacting us we can direct you to to more recent reviews. Welcome to Connemara Rentals- We own and operate individual, unique and luxurious holiday/vacation homes in Clifden, the capital of Connemara. Each property has been lovingly built or renovated by us over the years -set in their own grounds and gardens- offering private and quiet locations within a stones throw of the town. Finished to the highest standard aimed at discerning guests who are seeking unique properties and awarded the highest grading by Failte Ireland - the Irish Tourist Board. A smart country estate house originally built in circa 1820, sympathetically renovated and designed to give a comfortable and homely holiday experience for larger groups, family gatherings or friends, and host to Chelsea Clinton during her tour of Ireland. Within the grounds are mature gardens, ample parking, a large pool/barbecue terrace and outdoor seating areas providing a self contained estate, while the property is situated only 2 mins walk to the town square. All 11 bedrooms are uniquely decorated and are all en suite. The extensive ground floor living area gives enough room for everyone to relax without being on top of each other, whether it is in the main drawing room with large turf fire, the library, the television room with large turf fire, the dining room or kitchen. We have strong satellite throughout the house. An ideal base for exploring Connemara, with walks on the numerous stunning local beaches or in the most scenic countryside you are likely to encounter, or wandering to the local pub for a quiet pint or traditional irish music. **Your stay includes complimentary use of the nearby private leisure centre - 3 mins walk from the house. WIFI throughout. For further information, photos, maps, reviews and special offers please do not hesitate to contact us. -Offering private and quiet locations within a stones throw of the town. Also ideal for larger families, groups and small weddings. We live close by our holiday properties and are on hand to meet you when you arrive, to ensure you get settled in. Our aim is to provide a luxurious home away from home. When you arrive you will find the house fully set up, warm and cosy with fires lighting, and a welcome pack. The bedrooms and bathrooms are presented like hotel rooms with crisp white linen, towels and toiletries. We also provide a comprehensive information folder, with details of local amenities, services, maps and walking guides. The O’Grady Family purchased the Sunnybank estate in 1977. One of the oldest buildings in the locality, the Main House was built by John D’arcy who founded Clifden town in 1823. During 2002, Sunnybank House was extensively renovated into a luxurious holiday property and offers an outstanding holiday experience for larger groups with a private outdoor heated pool, sauna, extensive gardens. We purchased Sunnybank Cottage ( a neighbouring property) in 2004. It is a listed building and again one of the original houses of the town. It was completely renovated whilst retaining all the best of its original features and is now a luxurious and cosy version of the original cottage with the best of modern conveniences. The houses are furnished with a mix of antique or old country furniture, with the best quality of fixtures and fittings, bedding and household appliances. Each winter we spend time maintaining, improving or adding to each property in order to maintain standards.... We hope you enjoy ! Clifden Town is the capital of Connemara one of the most scenic regions in Ireland. Established in the early 1800’s at Clifden Bay, it follows the classic 19th century layout: oval in plan, with 3 principal streets – Market Street, Main Street and Bridge Street, a Market Square, a fine bridewell or gaol, courthouse and harbour. Clifden today is a vibrant and cultural town which has retained its historic roots while offering a wide range of services and facilities. You will find colourful streets with a great selection of small local food shops – (fishmongers, butchers, fruit and vegetable store, delicatessens and a bakery), numerous craft and gift shops, art galleries and exhibitions and other interesting shops including antique shops, designer clothes shops, jewellery and vintage shops. There are 9 restaurants and 10 pubs with music sessions each evening and good bar food.On the practical side there are four supermarkets, including Aldi and Lidl, which are open until 9pm (mon-sat), two banks, three chemists, two petrol stations, two churches and a post office. Set on the edge of the Atlantic, the surrounding scenery is spectacular, and waiting to be discovered. A vast coastal region world renowned for its wild and stunning scenery, and magical light. It is dotted with small villages and historical sites. To the north is stretches to the border of Mayo and the town of Westport is 45 mins. drive from Clifden. To the east it reaches to Galway city, which is one hours drive from Clifden and well worth a visit. To the south is the Connemara Gaelteacht area- an Irish speaking area which is famous for its coral strands. It includes a heated indoor swimming pool, Jacuzzi, Sauna, Steam room and Gym - Open 7 days all year round. The area is a walker’s paradise whether following a planned route or just ambling along country roads and beaches, of which there are many. You will find a folder of 20 different Connemara walks in your house or follow the road signs around the countryside which indicate good routes for walking or cycling. Bicycles can be hired throughout the year. A number of riding schools in the area offer pony trekking or lessons for all ages. Whether you are sailing to Clifden or wish to go sailing, contact Clifden boat club which is located at the end of the Beach road. They offer Sailing courses throughout the summer. Two of the country’s best adventure centres are located within 30 minutes drive from Clifden. They offer daily and weekly courses for both adults and children in sailing, windsurfing, orienteering, kayaking, rock climbing, bungee jumping, waterskiing, archery, clay pigeon shooting, amongst others. For private guided activities in or around Clifden including hill walking, rock climbing, kayaking on Clifden bay and surfing – for individuals or groups – All equipment provided, so no excuses ! You can also go scuba diving in a most beautiful area, north of Clifden. The Scuba Dive West Centre is one of the most established dive centres in the country and offers courses for all levels. The Killary Fjord Cruise is a 1.5 hour cruise along Ireland’s only Fjord with an interesting talk on the history of the area. There are several sailings daily between April and October. The Brazen Hussy – is a solid, ocean-going boat for day charters around the Connemara coast and islands, sea fishing or whale and dolphin watching. Connemara is world-renowned for its fresh water and sea fishing. Some of the most spectacular vistas can be seen from any of the National park walks, which range from a half-hour gentle ascent to a full climb to the peak of the Diamond Mountain, approximately 4 hours to the summit and back. Home to Connemara ponies, wild goats and Irish deer there is also a history museum, café, children’s playground and picnic area. Please do not hesitate to contact us for information on the above activities. ** ABOUT US** We live close by our holiday properties and are on hand to meet you when you arrive, to ensure you get settled in. Our aim is to provide a luxurious home away from home. When you arrive you will find the house fully set up, warm and cosy with fires lighting, and a welcome pack. The bedrooms and bathrooms are presented like hotel rooms with crisp white linen, towels and toiletries. We also provide a comprehensive information folder, with details of local amenities, services, maps and walking guides. ***** A LITTLE HISTORY****** The O’Grady Family purchased the Sunnybank estate in 1977. One of the oldest buildings in the locality, the Main House was built by John D’arcy who founded Clifden town in 1823. During 2002, Sunnybank House was extensively renovated into a luxurious holiday property and offers an outstanding holiday experience for larger groups with a private outdoor heated pool, sauna, extensive gardens. We purchased Sunnybank Cottage ( a neighbouring property) in 2004. It is a listed building and again one of the original houses of the town. It was completely renovated whilst retaining all the best of its original features and is now a luxurious and cosy version of the original cottage with the best of modern conveniences. The houses are furnished with a mix of antique or old country furniture, with the best quality of fixtures and fittings, bedding and household appliances. Each winter we spend time maintaining, improving or adding to each property in order to maintain standards.... We hope you enjoy ! “An Absolutely Accommodating Place!” -	Guest review. My extended family of 28 members recently returned from our dream trip to Ireland. We spent a week in Clifden renting both Sunnybank House and Lodge. It was so good that we found a place where we could all stay together and the location of Sunnybank is ideal. It is just a few minutes walk right into town and everyday we were able to make excursions out in the surrounding areas and easily return to Sunnybank so it was a great central location to stay in to tour the area. We were met by Shane who turned out to be the most accommodating host you can imagine answering all our questions and helping us with anything that came up. He arranged for my 81 year old Father and my brothers to play in Guy's Pub several evenings and this was an experience of a lifetime for my Father. We will forever be thankful to Shane for making that happen. The accommodations were wonderful, fully equipped kitchens, beautiful decor, inviting outside areas, and comfortable bedrooms. If you are traveling with a group this is a perfect location even if you have little ones. They provided us with highchairs and baby cots as we had 3 babies in our group. We used the kitchens quite a bit as we prepared breakfast every morning and cooked out a couple of nights using the outdoor grill. We also availed ourselves of having a local person, Gillian, prepare us a meal one evening that was quite delicious. We had been out touring all day and it was wonderful to arrive back and smell the meal she had prepared for us. All in all, I have to say that Sunnybank is one of the most accommodating places that I have stayed of all my trips to Europe. My family and I very much enjoyed our stay there and I would highly recommend Sunnybank House and Lodge! Thank you Shane for everything! All bedrooms have a bathroom en suite. White cotton towels and face cloths are provided. Gilchrist & Soames soap, shampoo, shower gel are provided. Loo roll provided. 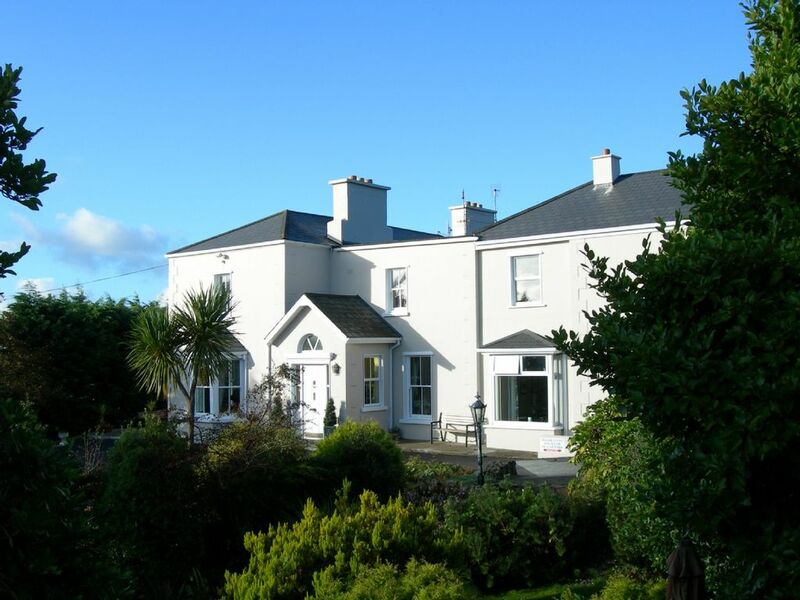 Sunnybank House is located in a private and quiet setting, in its own grounds on Church Hill, overlooking Clifden Town - it is a 2 minute walk to the town centre, bars, restaurants and supermarkets. Oil pwered central heating throughout. Large domestic dishwasher in the main kitchen and small catering dishwasher in the pantry kitchen. Large american Fridge and Freezer in the pantry kitchen, undercounter fridge in the main kitchen, storage fridge in the store room and full ice making machine. Large double oven below the gas hob. smaller electric wall mounted oven. Microwave oven. Second fridge, larder, Ice machine , preparation and washup area. Extra storage- utility area including washing facilities. Ample crockery, cutlery and glassware for 24 + people including second settings. Lots of kitchen ware, utensils and condiments. The main kitchen and pantry kitchen have recently undergone a full refurbishment in order to further improve the dining in experience for large parties. Full length french mahogany dining table. IPOD dock and separate stereo system provided. Large gardens , parking area and Tennis court within the grounds. The swimming Pool area has sunloungers, deck chairs, outdoor tables and a large Weber gas barbeque situated at the side of the pool. There is a sheltered area at the side of the pool for drying, sheltering, storage. The wood decked sauna is located in the pool area. The Pool area can be closed off by locking the wooden gates at the access points. Peat briquettes and fire lighters are supplied for the open fires. The large kitchen in sunnybank is exceptional - designed to cater for large numbers while retaining the traditional charm of the rest of the house. With cashmere granite counter tops, Siemens and Smeg appliances - there are three ovens and an extra large gas hob, with two large fridges and freezer space, two dishwashers, large commercial washing machine, the pantry kitchen off the main kitchen adds invaluable extra kitchen space and facilities to avoid kitchen pileups ! Our family of 23 stayed at the Sunnybank House for the week and wish it was longer. The description in the listing cannot compare to the beauty of this home! Shane is a fabulous person who was always available at a moments notice! We can only cherish every day we spent in Clifden - from the beauty and convenience of the house and grounds to the wonderful people in the town of Clifden. We had the best food and the most talented people playing music every night in whatever restaurant we went to. Everyone and everything was perfect! I know our grandchildren are looking forward to returning to catch up with the wonderful friends they made in the short week we spent. We had dinner catered by Gillian on Monday night for our granddaughters 21 birthday - it too was perfect from set up to clean up! What a delightful woman! She even made a birthday cake to celebrate the occasion! My husband and I have traveled to Ireland on four occasions and we have to say this trip will forever be the most cherished. We were so thrilled with how beautiful this house was and so convenient for our large group. Each bedroom had an ensuite bathroom which was so nice for all of us. We just felt so comfortable. The house was clean, beds were comfortable, the pool was warm, and even though the O'Grady's had just welcomed their first child into the world the day before we arrived Sean made it a point to get over at least twice during our visit to make sure everything was going well. The village is a quaint town with very friendly residents. Lots of pubs with live Irish folk music, cafes, bakeries, butchers, and other stores, activities, and points of interest very close by. We rented a car in Dublin and drove to Clifden, which was nerve-wracking as driving in Ireland can sometimes be a challenge. We discovered you can get tickets on Citilink bus from Clifden to Dublin for $20 Euro which is quite cheap. All in all, I would recommend Sunnybank House to anyone with a large group as we all enjoyed our stay. I would also recommend staying in Clifden as opposed to Dublin which was a little too big and too fast-paced for all of us that were looking for some Irish history and culture. Thanks to Sean and Rachael for making Sunnybank House such a lovely home away from home. What a fab place to stay. Shane had the fire lit and a lovely welcome pack of treats when we arrived. The house feels like home even though its huge. Our families had plenty of space to stretch out. The children loved paying hide and seek and the grown ups loved just relaxing. The house is very clean with all modern conveniences including an ice maker. We had our wedding week long celebration here and it exceeded our expectations. Gillian catered for us and everyone raved about the food. I loved the special effort she made for my fussy vegetarian needs. I'm told the lamb was amazing. We highly recommend this beautiful house in a very special location as a wonderful backdrop for lifelong happy memories. 20 of my best friends and family members from all over the US, Ireland and the UK convened in Clifden at Sunnybank House and Lodge to celebrate my birthday and that of my duaghter's father in law. Having been to Ireland before we thought we knew what to expect but Sunnybank exceeded all of our expectations. From booking imquiries right up to checking out Shane O'Grady, who we dubbed "The hardest working man in Galway" was as efficient and helpful as anyone could hope for. The property itself is just about perfect for a crew like ours. Each bedroom was lovely and comfortable. The kitchen, what a kitchen ! Feeding the lot of us was a breeze, Shane recommended a boat captain who took us out to the sea where we caught more than enough fish to feed us all a couple of times over. Directly from the sea through the kitchen and into the dining room and voila a meal that will be remembered for a long time. But the Fiesta mas grande was when Gillian came in and took over the kitchen to cook up delicious Irish feast for us. A short stroll of a couple of blocks and you're into town for shopping or just hanging around beautiful Clifden . Getting to Kylemore Abbey, Galway town and the Aran Islands is easy from there. Somehow Shane was able to order up a week of sunshine for us so we could swim in the pool every day. I have polled my constituency about our stay for this review and the results are unanimous. We booked Sunny bank house for our wedding at the start of May 2011. On arrival in the house we were blown away. Believe me when I say that the pictures of this house do not do it justice. We had 15 People staying in the house and it really felt like a home not just a rental. As a wedding venue we could not have asked for more. As a holiday home it is exquisite. On arrival Shane had the fires lit and some goodies for us to nibble. I would recommend this home to anyone who is looking for a truly amazing space and memories that will not soon be forgotten. Stayed in the 4 bedroomed seaside cottage over the May bank holiday weekend. We booked this as a surprise for my mother-in-laws 60th birthday. Absolutely fabulous. Would highly recommend this for a family holiday or for 4 couples heading away for a rural break. Clifden is about 5 mins down the road in a car, and cheap as chips in a taxi if you fancy a few pints in the town. Cottage is well kitted out, nicely finished, wifi, sky tv, etc. etc. Clifden is the Capital of Connemara and the epicentre of the Wild Atlantic Way. Clifden is recognised as one of the most scenic and unspoilt regions in Europe. One hour from Galway City and Westport, the area is blessed with stunning beaches, mountains, Connemara National Park, and traditional Irish fishing villages. Clifden has a population of 1000 people and is a vibrant cultural town with many restaurants, pubs, shops and facilities. An excellent base for discovering the real Ireland, it is unrivaled in its beauty and heritage. Unusually nowadays you will find a deserted beach, and can stroll throughout the countryside at your will where you will view spectacular scenery, Connemara ponies, wildlife, flora and fauna. Other Activities: Golf, Fishing, Festivals, Connemara National Park, Kylemore Abbey, Inishbofin Island, Walking tours, stunning beaches, Killary adventure centre, local history walks, local food tours. Clifden Sailing Club - With classes for children and adults throughout the summer - located 1 km from Sunnybank House. There is live music all-year-round in Clifden, ranging from local traditional sessions in the pubs, contemporary live bands, music festivals, Irish dancing shows, local theatre to a full arts and culture schedule at certain times of the year. There are many other activities and sights to see – details of which are updated every season. You can easily find out about these once you arrive in Clifden by calling into our tourist office or picking up the local free newspaper in any newsagent.